I have been all-about painting my nails lately! I am sure that the change of season has prompted it. What better time than Spring to perk up your tips and toes with some pretty polish? KB Shimmer is one of my go-to brands for unique on-trend polish. The colors, finishes, and glitter assortment is totally unique! 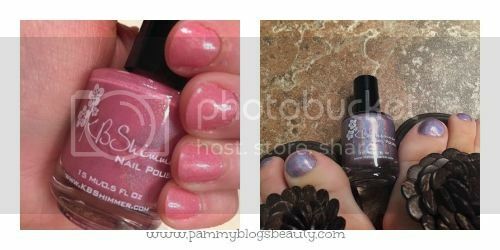 So, if you are ready to say goodbye to your dark winter shades and hello to something Spring-y and unique, you are going to want to check out these beautiful polishes!!! This new line of 12 new and seasonal polishes launched for Spring of 2015. These retail for $8.75 each. What a beautiful assortment of creamy pastels, metallic glitters, and plenty of sparkle and shine! Blush Money: Based on the 2015 Pantone Color, Strawberry Ice, this peachy-rose colored polish shows off gold shimmer indoors and a linear holographic rainbow shines while outside. This color is truly special! As a lover of all-things pink, I reach for this shade often and love how the color shifts every time the light hits it! It is gorgeous to wear!!! Funky Cold Patina: lol, love the name and love that I get it! ;) Like a long forgotten ancient copper statue turned blue green in color, this polish features a cool turquoise green base, with pops of metallic copper, blue, and purple. This is one of those KB Shimmer shades that is sure to get noticed! It is just *that different*! This shade is so supremely Summery. Love it on my toes! Meow or Never: Based on the Pantone spring color Glacier Gray, this polish is a very pale gray, almost white in color with pops of purple, gray, periwinkle, and sky blue. I love going with super light nails for Spring and Summer. This is a nice alternative to a classic white nail. It is grey-white with gorgeous blue/purple glitter! Again, another truly unique shade! To Peach His Own: This pale peach polish shines with holographic glitters in lime green, gold, violet, and magenta. The peach is so light, it is almost a cream color. Very Summery shade! Eyes White Open: A white cream with two coat coverage, a staple for any girl's nail polish collection. White polish is so versatile. It certainly is a must-have. This one gives really nice coverage and great wear! Nail art, french tips, or an all-over white. Thistle Be The Day: A pale pinkish purple that shines in the sun with a linear holographic glitter. Gorgeous, gorgeous, gorgeous holographic soft lilac polish! Such a wearable color! The holographic sparkle is so eye-catching!!! I am absolutely obcessed with this KBShimmer Spring Collection! The polishes are gorgeously unique and I love that! KB Shimmer is available at KBShimmer.com, Amazon.com and at select salons & retailers. For sales outside the U.S., visit www.harlowandco.org.